The Indian Independence Movement incorporated the efforts by Indians to liberate the region from British, French and Portuguese and form the nation-state of India. It involved a wide spectrum of Indian political organizations, philosophies, and rebellions between 1857 and India's emergence as an unified nation-state on August 15, 1947. 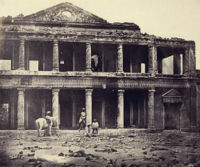 The initial Indian Rebellion of 1857 was sparked when soldiers serving in the British East India Company's British Army and Indian kingdoms rebelled against the British. After the revolt was crushed, the British partitioned the region into British India and the Princely States, focusing on the industrial development of the former region. India developed a class of educated elites whose political organizing sought Indian political rights and representation. However, increasing public disenchantment with the British authority— their curtailing of Indian civil liberties (such as the Rowlatt Act), political rights, and culture as well as alienation from issues facing common Indians — led to an upsurge in revolutionary activities aimed at overthrowing the European colonial powers, particularly the British. The movement came to a head between 1918 and 1922 when the first series of non-violent campaigns of civil disobedience were launched by the Indian National Congress under the leadership of Mohandas Gandhi- whose methods were inspired to a large extent by the philosophy and methods of Baba Ram Singh, a Sikh who led the Kuka Movement in the Punjab in the 1870s. Gandhi's movement came to encompass people from across India and across all walks of life. These initial civil-disobedience movements soon came to be the driving force that ultimately shaped the cultural, religious, and political unity of a then still dis-united nation. Committing itself to Purna Swaraj in 1930, the Congress led mass struggles between 1930 and 1932. By the late 1930s, however, with growing disenchantments over the delaying tactics of the Raj and the Congress's failure to extract commitment on self-rule and political independence, a faction within the movement turned towards more radical ideas of Subhash Chandra Bose. Bose's actions proved controversial among the congress party but popular within the Indian populace, when Bose defeated in Gandhi's candidate in leadership elections in the Tripuri Session of the Congress Working Committee. However, this was the parting of ways between the radical and the conservatives. Bose left the Congress to found his own party. During the war, who sought first Soviet and then Axis help to raise a liberation force. The raising of the Indian National Army in 1942 by Subhash Chandra Bose would see a unique military campaign to end British rule. Following the trial of Indian National Army officers at the Red Fort, mutinies broke out in the navy, in the Air Force, and in the army. The congress also led a civil disobedience movement in 1942 demanding that the British leave India (a movement called the Quit India Movement). Following these and widespread communal rioting in Calcutta, the Raj ended on the mid-night of 15th August, 1947, but only at the expense of the Partition of the country into India and Pakistan. European traders came to Indian shores with the arrival of Portuguese explorer Vasco da Gama in 1498 at the port of Calicut in search of the lucrative spice trade. 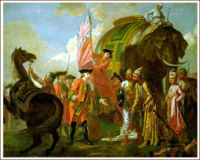 After the 1757 Battle of Plassey, during which the British army under Robert Clive defeated the Nawab of Bengal, the British East India Company established itself. This is widely seen as the beginning of the British Raj in India. The Company gained administrative rights over Bengal, Bihar, and Orissa in 1765 after the Battle of Buxar. They then annexed Punjab in 1849 after the death of Maharaja Ranjit Singh d.1839 and the First Anglo-Sikh War (1845–1846) and then Second Anglo-Sikh War (1848-1849). The British parliament enacted a series of laws to handle the administration of the newly-conquered provinces, including the Regulating Act of 1773, the India Act of 1784, and the Charter Act of 1813; all enhanced the British government's rule. In 1835 English was made the medium of instruction. Western-educated Hindu elites sought to rid Hinduism of controversial social practices, including the varna (caste) system, child marriage, and sati. Literary and debating societies initiated in Bombay and Madras became fora for open political discourse. The Educational attainment and skillful use of the press by these early reformers meant that the possibility grew for effecting broad reforms, all without compromising larger Indian social values and religious practices. Even while these modernising trends influenced Indian society, Indians increasingly despised British rule. The memoirs of Henry Ouvry of the 9th Lancers record many "a good thrashing" to careless servants. A spice merchant, Frank Brown, wrote to his nephew that stories of maltreatment of servants had not been exaggerated and that he knew people who kept orderlies "purposely to thrash them". As the British increasingly dominated the continent, they grew increasingly abusive of local customs by, for example, staging parties in mosques, dancing to the music of regimental bands on the terrace of the Taj Mahal, using whips to force their way through crowded bazaars (as recounted by General Henry Blake), and mistreating sepoys. In the years after the annexation of Punjab in 1849, several mutinies among sepoys broke out; these were put down by force. Several regional movements against foreign rule were staged in various parts of pre-1857 India. However, they were not united and were easily controlled by the foreign rulers. Examples include the Sannyasi Rebellion in Bengal in the 1770s an 1787 ethnic revolt against Portuguese control of Goa known as the Conspiracy Of The Pintos and uprisings by South Indian local chieftains against British rule. Notable among the latter is Veerapandya Kattabomman, who ruled the present-day Tuticorin district of Tamil Nadu. He questioned the need for native Indians to pay taxes on agricultural produce to foreign rulers and battled the British until the latter, victorious, hanged him. Other movements included the Santal Rebellion and the resistance offered to the British by Titumir in Bengal, the Kittur rebellion led by Rani Chennamma and Sangolli Rayanna in Karnataka. The Indian Rebellion of 1857 was a period of uprising in northern and central India against British rule in 1857–58. The rebellion was the result of decades of ethnic and cultural differences between Indian soldiers and their British officers. The indifference of the British towards Indian rulers like the Mughals and ex- Peshwas and the annexation of Oudh were political factors triggering dissent amongst Indians. Dalhousie’s policy of annexation, the Doctrine of lapse or escheat, and the projected removal of the descendants of the Great Mughal from their ancestral palace to the Qutb, near Delhi also angered some people. The specific reason that triggered the rebellion was the rumoured use of cow and pig fat in .557 calibre Pattern 1853 Enfield (P/53) rifle cartridges. Soldiers had to break the cartridges with their teeth before loading them into their rifles, so if there was cow and pig fat, it would be offensive to Hindu and Muslim soldiers. In February 1857, sepoys (Indian soldiers in the British army) refused to use their new cartridges. The British claimed to have replaced the cartridges with new ones and tried to make sepoys make their own grease from beeswax and vegetable oils, but the rumour persisted. In March 1857, Mangal Pandey, a soldier of the 34th Native Infantry, attacked his British sergeant and wounded an adjutant. General Hearsay, who said Pandey was in some kind of "religious frenzy," ordered a jemadar to arrest him but the jemadar refused. Mangal Pandey was hanged on 7 April along with the jemadar. The whole regiment was dismissed as a collective punishment. On May 10th, when the 11th and 20th cavalry assembled, they broke rank and turned on their commanding officers. They then liberated the 3rd Regiment, and on 11 May, the sepoys reached Delhi and were joined by other Indians. Soon, the revolt spread throughout the northern India. Some notable leaders were Ahmed Ullah, an advisor of the ex-King of Oudh; Nana Sahib; his nephew Rao Sahib and his retainers, Tantia Topi and Azimullah Khan; the Rani of Jhansi; Kunwar Singh; the Rajput chief of Jagadishpur in Bihar; and Firuz Saha, a relative of the Mughal Emperor, Bahadur Shah. The Red Fort, the residence of the last Mughal emperor Bahadur, was attacked and captured by the sepoys. They demanded that he reclaim his throne. He was reluctant at first, but eventually agreed to the demands and became the leader of the rebellion. About the same time in Jhansi, the army rebelled and killed the British army officers. Revolts also broke out in places like Meerut, Kanpur, Lucknow etc. The British were slow to respond, but eventually responded with brute force. British moved regiments from the Crimean War and diverted European regiments headed for China to India. The British fought the main army of the rebels near Delhi in Badl-ke-Serai and drove them back to Delhi before laying a siege on the city. 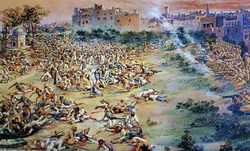 The siege of Delhi lasted roughly from 1 July to 31 August. After a week of street fighting, the British retook the city. The last significant battle was fought in Gwalior on 20 June 1858. It was during this battle that Rani Lakshmi Bai was killed. Sporadic fighting continued until 1859 but most of the rebels were subdued. The war of 1857 was a major turning point in the history of modern India. The British abolished the British East India Company and replaced it with direct rule under the British crown. A Viceroy was appointed to represent the Crown. In proclaiming the new direct-rule policy to "the Princes, Chiefs, and Peoples of India," Queen Victoria promised equal treatment under British law, but Indian mistrust of British rule had become a legacy of the 1857 rebellion. The British embarked on a program of reform, trying to integrate Indian higher castes and rulers into the government. They stopped land grabs, decreed religious tolerance and admitted Indians into civil service, albeit mainly as subordinates. They also increased the number of British soldiers in relation to native ones and allowed only British soldiers to handle artillery. Bahadur Shah was exiled to Rangoon, Burma where he died in 1862, finally bringing the Mughal dynasty to an end. In 1877, Queen Victoria took the title of Empress of India. The decades following the Sepoy Rebellion were a period of growing political awareness, manifestation of Indian public opinion and emergence of Indian leadership at national and provincial levels. The influences of socio-religious groups, especially in a nation where religion plays a vital role cannot be undermined. The Arya Samaj was an important Hindu organization which sought to reform Hindu society of social evils, counter-act Christian missionary propaganda. Swami Dayanand Saraswati's work was important in increasing an attitude of self-awareness, pride and community service in common Indian peoples. Raja Ram Mohan Roy's Brahmo Samaj was also a pioneer in the reform of Indian society, fighting evils like sati, dowry, ignorance and illiteracy. In Tamil Nadu (during 1910's) one of the earliest challenges to the Imperial British trade monopoly was attempted by V. O. Chidambaram Pillai. A lawyer born in Ottapidaram, Tirunelveli district of Tamil Nadu, he later started a small shipping company offering services to Ceylon in competition to the British, later to be arrested and put to rigorous imprisonment, with his bar license stripped. Later he would die penniless in Kovilpatti. He would later inspire another freedom fighter Vanjinathan, killed then collector Ash and shot himself. The inculcation of religious reform and social pride was fundamental to the rise of a public movement for complete nationhood. The work of men like Swami Vivekananda, Ramakrishna Paramhansa, Sri Aurobindo, Subramanya Bharathy, Bankim Chandra Chatterjee, Sir Syed Ahmed Khan, Rabindranath Tagore and Dadabhai Naoroji spread the passion for rejuvenation and freedom. Lokmanya Tilak, though with non-moderate views, was very popular amongst the masses. He gave the concept of Swaraj to the Indian peoples while standing trial. His popular sentence "Swaraj is my birthright, and I shall have it" became the source of inspiration for Indians. The flames of the spirit of freedom were ignited by learned men like them, who gave reason for common Indians to feel proud of themselves, demand political and social freedom and seek happiness. They were the teachers who sparked the passion of learning and achievement for thousands of Indians, and the poets expressing the inner fires of the freedom-fighter's soul. The Moplah Rebellion occurred in 1921. It was a British-Muslim and Hindu-Muslim conflict in Kerala. The reasons for the Moplah rebellion are rooted in religious revivalism among the Muslim Moplahs (also known as Mappilas), disaffection with British governance, and resentment at the land owning Hindu Nair community. Events following the Khilafat movement helped organize Moplahs and gave impetus to their actions. During the early months of 1921, multiple events including the Khilafat movement and the Karachi resolution fueled the fires of rebellion. A rumour spread amongst the Moplahs that the British rule had ended and the Islamic Caliphate had been re-established at Delhi. On Aug 20, the first incident of the rebellion occurred at Tirurangadi when the District Magistrate of Calicut with the help of troops attempted to arrest a few Moplah leaders who were in the possession of arms, resulting in clashes. Arsonists took to the street, burning and destroying government property. The initial focus was on the British, but when the limited presence of the British was eliminated, Moplahs turned their full attention on the Hindus. By the end of 1921 the situation was brought back under control by the British with the help of a quasi-military battalion. According to official records, the government lost 43 troops with 126 wounded while the Moplahs lost 3,000 (with Moplah accounts putting the number at over 10,000). Though this was an act of courage against British rule, it was also an act of savagery against the Hindus, on whom unspeakable crimes were committed, especially the women. Due to this, it is also considered as a jihad against all non-Muslims (Hindu and British) to impose Islamic rule in the area. Inspired by a suggestion made by A.O. Hume, a retired British civil servant, seventy-three Indian delegates met in Bombay in 1885 and founded the Indian National Congress. They were mostly members of the upwardly mobile and successful western-educated provincial elites, engaged in professions such as law, teaching, and journalism. They had acquired political experience from regional competition in the professions and by securing nomination to various positions in legislative councils, universities, and special commissions. It should be noted that Dadabhai Naoroji had already formed the Indian National Association a few years before the Congress. The INA merged into the Congress Party to form a bigger national front. At its inception, the Congress had no well-defined ideology and commanded few of the resources essential to a political organization. It functioned more as a debating society that met annually to express its loyalty to the British Raj and passed numerous resolutions on less controversial issues such as civil rights or opportunities in government, especially the civil service. These resolutions were submitted to the Viceroy's government and occasionally to the British Parliament, but the Congress's early gains were meagre. Despite its claim to represent all India, the Congress voiced the interests of urban elites; the number of participants from other economic backgrounds remained negligible. By 1900, although the Congress had emerged as an all-India political organization, its achievement was undermined by its singular failure to attract Muslims, who felt that their representation in government service was inadequate. Attacks by Hindu reformers against religious conversion, cow slaughter, and the preservation of Urdu in Arabic script deepened their concerns of minority status and denial of rights if the Congress alone were to represent the people of India. Sir Syed Ahmed Khan launched a movement for Muslim regeneration that culminated in the founding in 1875 of the Muhammadan Anglo-Oriental College at Aligarh, Uttar Pradesh (renamed Aligarh Muslim University in 1921). Its objective was to educate wealthy students by emphasizing the compatibility of Islam with modern western knowledge. The diversity among India's Muslims, however, made it impossible to bring about uniform cultural and intellectual regeneration. In 1905, Lord Curzon, the Viceroy and Governor-General (1899–1905), ordered the partition of the province of Bengal for improvements in administrative efficiency in that huge and populous region, where the Bengali Hindu intelligentsia exerted considerable influence on local and national politics. The partition created two provinces: Eastern Bengal & Assam, with its capital at Dhaka, and West Bengal, with its capital at Calcutta (which also served as the capital of British India). An ill-conceived and hastily implemented action, the partition outraged Bengalis. Not only had the government failed to consult Indian public opinion, but the action appeared to reflect the British resolve to divide and rule. Widespread agitation ensued in the streets and in the press, and the Congress advocated boycotting British products under the banner of swadeshi. During this period nationalist poet Rabindranath Tagore penned and composed a song (roughly translated into English as "The soil of Bengal, the water of Bengal be hallowed…") and himself led people to the streets singing the song and tying Rakhi on each other's wrists. The people did not cook any food (Arandhan) on that day. The Congress-led boycott of British goods was so successful that it unleashed anti-British forces to an extent unknown since the Sepoy Rebellion. A cycle of violence and repression ensued in some parts of the country (see Alipore bomb case). The British tried to mitigate the situation by announcing a series of constitutional reforms in 1909 and by appointing a few moderates to the imperial and provincial councils. A Muslim deputation met with the Viceroy, Lord Minto (1905–10), seeking concessions from the impending constitutional reforms, including special considerations in government service and electorates. The All-India Muslim League was founded the same year to promote loyalty to the British and to advance Muslim political rights, which the British recognized by increasing the number of elective offices reserved for Muslims in the India Councils Act of 1909. The Muslim League insisted on its separateness from the Hindu-dominated Congress, as the voice of a "nation within a nation." In what the British saw as an additional goodwill gesture, in 1911 King-Emperor George V visited India for a durbar (a traditional court held for subjects to express fealty to their ruler), during which he announced the reversal of the partition of Bengal and the transfer of the capital from Calcutta to a newly planned city to be built immediately south of Delhi, which later became New Delhi. World War I began with an unprecedented outpouring of loyalty and goodwill towards the United Kingdom, contrary to initial British fears of an Indian revolt. India contributed massively to the British war effort by providing men and resources. About 1.3 million Indian soldiers and labourers served in Europe, Africa, and the Middle East, while both the Indian government and the princes sent large supplies of food, money, and ammunition. But high casualty rates, soaring inflation compounded by heavy taxation, a widespread influenza epidemic, and the disruption of trade during the war escalated human suffering in India. The prewar nationalist movement revived, as moderate and extremist groups within the Congress submerged their differences in order to stand as a unified front. In 1916, the Congress succeeded in forging the Lucknow Pact, a temporary alliance with the Muslim League over the issues of devolution of political power and the future of Islam in the region. The British themselves adopted a "carrot and stick" approach in recognition of India's support during the war and in response to renewed nationalist demands. In August 1917, Edwin Montagu, the secretary of state for India, made the historic announcement in Parliament that the British policy for India was "increasing association of Indians in every branch of the administration and the gradual development of self-governing institutions with a view to the progressive realization of responsible government in India as an integral part of the British Empire." The means of achieving the proposed measure were later enshrined in the Government of India Act of 1919, which introduced the principle of a dual mode of administration, or diarchy, in which both elected Indian legislators and appointed British officials shared power. The act also expanded the central and provincial legislatures and widened the franchise considerably. Diarchy set in motion certain real changes at the provincial level: a number of non-controversial or "transferred" portfolios, such as agriculture, local government, health, education, and public works, were handed over to Indians, while more sensitive matters such as finance, taxation, and maintaining law and order were retained by the provincial British administrators. The positive impact of reform was seriously undermined in 1919 by the Rowlatt Act, named after the recommendations made the previous year to the Imperial Legislative Council by the Rowlatt Commission, which had been appointed to investigate "seditious conspiracy." The Rowlatt Act, also known as the Black Act, vested the Viceroy's government with extraordinary powers to quell sedition by silencing the press, detaining political activists without trial, and arresting any individuals suspected of sedition or treason without a warrant. In protest, a nationwide cessation of work ( hartal) was called, marking the beginning of widespread, although not nationwide, popular discontent. The agitation unleashed by the acts culminated on 13 April 1919, in the Amritsar Massacre (also known as the Jallianwala Bagh massacre) in Amritsar, Punjab. The British military commander, Brigadier-General Reginald Dyer, ordered his soldiers to fire into an unarmed and unsuspecting crowd of some 10,000 people. They had assembled at Jallianwala Bagh, a walled garden, to celebrate Baisakhi, a Sikh festival, without prior knowledge of the imposition of martial law. A total of 1,650 rounds were fired, killing 379 people and wounding 1,137 in the episode, which dispelled wartime hopes of home rule and goodwill in a frenzy of post-war reaction. It can be argued that the movement, even towards the end of First World War, were far removed from the masses of India, focussing essentially on a unified commmerce-oriented territory and a far cry from the calls for an united nation, that came in the 1930s. Possibly one of the factors that brought this movement to the masses was the entry of Mohandas Karamchand Gandhi in Indian Politics in 1915. Gandhi had been a prominent leader of anti apartheid movement in South Africa and had been vocal basic discrimination and abusive labour treatment as well as suppressive police control akin to the Rowlatt Acts. During these protests Gandhi had perfected the concept of satyagraha, on which he had been inspired by the philosophy of Baba Ram Singh(famous for leading the Kuka Movement in the Punjab in 1872). The end of the protests in the country saw repeal of the legislations and release of political prisoners by Gen. Jan Smuts, head of the South African Government of the time. However Gandhi, a stranger to India and it’s politics after twenty years, had initially entered the fray not with calls for a nation-state, but in support of the unified commmerce-oriented territory, that the Congress Party had been asking for. Gandhi, however, was of the opinion that the industrial development and educational development that the Europeans brought with them was required to uplift India's problems. A veteran Congressman and Indian leader Gopal Krishna Gokhale became Gandhi's mentor. Gandhi's ideas and strategies of non-violent civil disobedience initially appeared impractical to some Indians and veteran Congressmen. In Gandhi's own words, "civil disobedience is civil breach of unmoral statutory enactments," but as he viewed it, it had to be carried out non-violently by withdrawing cooperation with the corrupt state. Gandhi's ability to inspire millions of common people was initiated when he used satyagraha during the anti-Rowlatt Act protests in Punjab. Gandhi’s vision would soon bring the population of millions into the movement. In Champaran, Bihar, the Congress Party brought forth the plight of desperately poor sharecroppers, landless farmers who were being forced to grow cash crops at the expense of crops which formed their food supply, and pay oppressive taxes. Neither were they sufficiently paid for sustenance. It was at this time also that the nationalist cause was integrated to the interests and industries that formed the economy of common Indians. The first satyagraha movement urged the use of Khadi and Indian material as alternatives to those shipped from Britain. It also urged the boycott of British educational institutions, law courts,; to resign from government employment; to refuse to pay taxes; and to forsake British titles and honours. Although this came too late to influence the framing of the new Government of India Act of 1919, the magnitude of disorder resulting from the movement was unparalleled and presented a new challenge to foreign rule. These movements found widespread support among a people awakening to a new sense of nationalism. However, the movement was called off by Gandhi following the Chauri Chaura incident, which saw the death of twenty two policemen in the hands of an angry mob. In 1920, the Congress was reorganized and given a new constitution, whose goal was Swaraj (independence) . Membership in the party was opened to anyone prepared to pay a token fee, and a hierarchy of committees was established and made responsible for discipline and control over a hitherto amorphous and diffuse movement. The party was transformed from an elite organization to one of mass national appeal and participation. Gandhi was imprisoned in 1922 for six years, but was released after serving two. On his release from prison, he set up the Sabarmati Ashram in Ahmedabad, on the banks of river Sabarmati, established the newspaper Young India, and inaugurated a series of reforms aimed at the socially disadvantaged within Hindu society - the rural poor, and the untouchables. This era saw the emergence of new generation of Indians from within the Congress Party, including C. Rajagopalachari, Jawaharlal Nehru, Vallabhbhai Patel, Subhash Chandra Bose and others- who would later on come to form the prominent voices of the Indian Independence Movement, whether keeping with Gandhian Values, or diverging from it. The Indian political spectrum was further broadened in the mid-1920s by the emergence of both moderate and militant parties, such as the Swaraj Party, Hindu Mahasabha, Communist Party of India and the Rashtriya Swayamsevak Sangh. Regional political organizations also continued to represent the interests of non- Brahmins in Madras, Mahars in Maharashtra, and Sikhs in Punjab. Following the rejection of the recommendations of the Simon Commission by Indians, an all-party conference was held at Bombay in May 1928. The conference appointed a drafting committee under Motilal Nehru to draw up a constitution for India. The Calcutta session of the Indian National Congress asked the British government to accord dominion status to India by December 1929, or a countrywide civil disobedience movement would be launched. The Indian National Congress, at its historic Lahore session in December 1929, under the presidency of Jawaharlal Nehru, adopted a resolution to gain complete independence from the British. It authorised the Working Committee to launch a civil disobedience movement throughout the country. It was decided that 26 January 1930 should be observed all over India as the Purna Swaraj (complete independence) Day. Many Indian political parties and Indian revolutionaries of a wide spectrum united to observe the day with honour and pride. Gandhi emerged from his long seclusion by undertaking his most famous campaign, a march of about 400 kilometres from his commune in Ahmedabad to Dandi, on the coast of Gujarat between 12 March and 6 April 1930. The march is usually known as the Dandi March or the Salt Satyagraha. At Dandi, in protest against British taxes on salt, he and thousands of followers broke the law by making their own salt from seawater. In April 1930 there were violent police-crowd clashes in Calcutta. Approximately over 100,000 people were imprisoned in the course of the Civil disobedience movement (1930-31), while in Peshawar unarmed demonstrators were fired upon in the Qissa Khwani bazaar massacre. While Gandhi was in jail, the first Round Table Conference was held in London in November 1930, without representation from the Indian National Congress. The ban upon the Congress was removed because of economic hardships caused by the satyagraha. Gandhi, along with other members of the Congress Working Committee, was released from prison in January 1931. In March of 1931, the Gandhi-Irwin Pact was signed, and the government agreed to set all political prisoners free(Although, some of the key revolutionaries were not set free and the death sentence for Bhagat Singh and his two comrades was not taken back which further intenced the agitation against congres not only outside it but with in the congress it self). In return, Gandhi agreed to discontinue the civil disobedience movement and participate as the sole representative of the Congress in the second Round Table Conference, which was held in London in September 1931. However, the conference ended in failure in December 1931. Gandhi returned to India and decided to resume the civil disobedience movement in January 1932. For the next few years, the Congress and the government were locked in conflict and negotiations until what became the Government of India Act of 1935 could be hammered out. By then, the rift between the Congress and the Muslim League had become unbridgeable as each pointed the finger at the other acrimoniously. The Muslim League disputed the claim of the Congress to represent all people of India, while the Congress disputed the Muslim League's claim to voice the aspirations of all Muslims. Apart from a few stray incidents, the armed rebellion against the British rulers were not organized before the beginning of the 20th century. The revolutionary philosophies and movement made its presence felt during the 1905 Partition of Bengal. Arguably, the initial steps to organize the revolutionaries were taken by Aurobindo Ghosh, his brother Barin Ghosh, Bhupendranath Datta etc. when they formed the Jugantar party in April 1906. Jugantar was created as an inner circle of the Anushilan Samiti which was already present in Bengal mainly as a revolutionary society in the guise of a fitness club. The Jugantar party leaders like Barin Ghosh and Bagha Jatin initiated making of explosives. The Alipore bomb case, following the Muzaffarpur killing tried several activists and many were sentenced deportation for life, while Khudiram Bose was hanged. Madan Lal Dhingra, a student in London, murdered Sir Curzon Wylie, a British M.P. on 1 July 1909 in London. The Anushilan Samiti and Jugantar opened several branches throughout Bengal and other parts of India and recruited young men and women to participate in the revolutionary activities. Several murders and looting were done, with many revolutionaries being captured and imprisoned. During the First World War, the revolutionaries planned to import arms and ammunitions from Germany and stage an armed revolution against the British. The Ghadar Party operated from abroad and cooperated with the revolutionaries in India. This party was instrumental in helping revolutionaries inside India catch hold of foreign arms. After the First World War, the revolutionary activities suffered major setbacks due to the arrest of prominent leaders. In 1920s, the revolutionary activists started to reorganize. Hindustan Socialist Republican Association was formed under the leadership of Chandrasekhar Azad. Bhagat Singh and Batukeshwar Dutt threw a bomb inside the Central Legislative Assembly on 8 April 1929 protesting against the passage of the Public Safety Bill and the Trade Disputes Bill. Following the trial (Central Assembly Bomb Case), Bhagat Singh, Sukhdev and Rajguru were hanged in 1931. Surya Sen, along with other activists, raided the Chittagong armoury on 18 April 1930 to capture arms and ammunition and to destroy government communication system to establish a local governance. Pritilata Waddedar led an attack on European club in Chittagong in 1932, while Bina Das attempted to assassinate Stanley Jackson, the Governor of Bengal inside the convocation hall of Calcutta University. Following the Chittagong armoury raid case, Surya Sen was hanged and several other were deported for life to the Cellular Jail in Andaman. The Bengal Volunteers started operating in 1928. On 8 December 1930, the Benoy- Badal- Dinesh trio of the party entered the secretariat Writers' Building in Kolkata and murdered Col NS Simpson, the Inspector General of Prisons. On 13 March 1940, Udham Singh shot Sir Michael O'Dwyer, generally held responsible for the Amritsar Massacre, in London. However, as the political scenario changed in the late 1930s — with the mainstream leaders considering several options offered by the British and the religious politics coming into play — the revolutionary activities gradually declined. Many past revolutionaries joined mainstream politics by joining Congress and other parties, especially communist ones, while many of the activists were kept under hold in different jails across the country. In 1939, the Viceroy Lord Linlithgow declared India's entrance into World War II without consulting provincial governments. In protest, the Congress asked all of its elected representatives to resign from the government. Jinnah, the president of the Muslim League, persuaded participants at the annual Muslim League session at Lahore in 1940 to adopt what later came to be known as the Lahore Resolution, demanding the division of India into two separate sovereign states, one Muslim, the other Hindu; sometimes referred to as Two Nation Theory. Although the idea of Pakistan had been introduced as early as 1930, very few had responded to it. However, the volatile political climate and hostilities between the Hindus and Muslims transformed the idea of Pakistan into a stronger demand. Indians throughout the country were divided over World War II, as the Lord Linlithgow, without consulting the Indian representatives had unilaterally declared India a belligerent on the side of the allies. In opposition to Linlithgow's action, the entire congress leadership resigned from the local government councils. However, many wanted to support the British war effort, and indeed the British Indian Army was one of the largest volunteer force during the war. Especially during the Battle of Britain, Gandhi resisted calls for massive civil disobedience movements that came from within as well as outside his party, stating he did not seek India's freedom out of the ashes of a destroyed Britain. However, like the changing fortunes of the war itself, the movement for freedom saw the rise of two movements that formed the climax of the 100-year struggle for independence. The first of these, the Azad Hind movement led by Netaji Subhash Chandra Bose, saw it's inception early in the war and sought help from the Axis Powers. The second saw its inception in August 1942 led by Gandhi and began following failure of the Cripps' mission to reach a consensus with the Indian political leadership over the transfer of power after the war. The arbitrary entry of India into the war was strongly opposed by Subhash Chandra Bose, who had been elected President of the Congress twice, in 1937 and 1939. After lobbying against participation in the war, he resigned from Congress in 1939 and started a new party, the All India Forward Bloc. When war broke out, the Raj had put him under house arrest in Calcutta in 1940. However, at the time the war was at it's bloodiest in Europe and Asia, he escaped and made his way through Afghanistan to Germany to seek Axis help to raise an army to fight the shackles of the Raj.Here, he raised with Rommel's Indian PoWs what came to be known as the Free India Legion. This came to be the conceptualisation in embryonic form of Bose's dream of raising a liberation Army to fight the Raj. 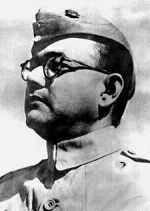 However, the turn of tides in the Battlefields of Europe saw Bose make his way ultimately to Japanese South Asia where he formed what came to be known as the Azad Hind Government as the Provisional Free Indian Government in exile, and organized the Indian National Army with Indian POWs and Indian expatriates at South-East Asia, with the help of the Japanese. Its aim was to reach India as a fighting force that would build on public resentment to inspire revolts among Indian soldiers to defeat the Raj. The INA was to see action against the allies, including the British Indian Army, in the forests of in Arakan, Burma and Assam, laying siege on Imphal and Kohima with the Japanese 15th Army. During the war, the Andaman and Nicobar islands were captured by the Japanese and handed over by them to the INA; Bose renamed them Shahid (Martyr) and Swaraj (Independence). The INA would ultimately fail, owing to disrupted logistic, poor arms and supplies from the Japanese, and lack of support and training . The INA's efforts ended with the surrender of Japan in 1945. The existence of Azad Hind was essentially coterminous with the existence of the Indian National Army. While the government itself continued until the civil administration of the Andaman Islands was returned to the jurisdiction of the British towards the end of the war, the limited power of Azad Hind was effectively ended with the surrender of the last major contingent of INA troops in Rangoon. The supposed death of Bose is seen as culmination of the entire Azad Hind Movement. Following the surrender of Japan, the troops of the INA were brought to India and a number of them charged with treason. However, Bose's audacious actions and radical initiative had by this time captured the public imagination and also turned the inclination of the native soldiers of the British Indian Forces from one of loyalty to the crown to support for the soldiers that the Raj deemed as collaborators..
After the war, the stories of the Azad Hind movement and its army that came into public limelight during the trials of soldiers of the INA in 1945 were seen as so inflammatory that, fearing mass revolts and uprisings — not just in India, but across its empire —, the British Government forbid the BBC from broadcasting their story. Newspapers reported the summary execution of INA soldiers held at Red Fort. During and after the trial, mutinies broke out in the British Indian Armed forces, most notably in the Royal Indian Navy which found public support throughout India, from Karachi to Bombay and from Vizag to Calcutta. Many historians have argued that it was the INA and the mutinies it inspired among the British Indian Armed forces that were the true driving force for India's independence. The Quit India Movement (Bharat Chhodo Andolan) or the August Movement was a civil disobedience movement in India launched in August 1942 in response to Gandhi's call for immediate independence of India. The aim was to bring the British Government to the negotiating table by holding the Allied War Effort hostage. The call for determined but passive resistance that signified the certitude that Gandhi foresaw for the movement is best described by his call to Do or Die, issued on 8 August at the Gowalia Tank Maidan in Bombay, since re-named August Kranti Maidan (August Revolution Ground). However, almost the entire Congress leadership, and not merely at the national level, was put into confinement less than twenty-four hours after Gandhi's speech, and the greater number of the Congress leaders were to spend the rest of the war in jail. At the outbreak of war, the Congress Party had during the Wardha meeting of the working-committee in September 1939, passed a resolution conditionally supporting the fight against fascism, but were rebuffed when they asked for independence in return. The draft proposed that if the British did not accede to the demands, a massive Civil Disobedience would be launched. However, it was an extremely controversial decision. The Congress had lesser success in rallying other political forces under a single flag and mast. On August 8, 1942 the Quit India resolution was passed at the Bombay session of the All India Congress Committee (AICC). At Gowalia Tank, Mumbai Gandhi urged Indians to follow a non-violent civil disobedience. Gandhi told the masses to act as an independent nation and not to follow the orders of the British. The British, already alarmed by the advance of the Japanese army to the India–Burma border, responded the next day by imprisoning Gandhi at the Aga Khan Palace in Pune. The Congress Party's Working Committee, or national leadership was arrested all together and imprisoned at the Ahmednagar Fort. They also banned the party altogether. Large-scale protests and demonstrations were held all over the country. Workers remained absent en masse and strikes were called. The movement also saw widespread acts of sabotage, Indian under-ground organisation carried out bomb attcks on allied supply convoys, government buildings were set on fire, electricity lines were disconnected and transport and communication lines were severed. The British swiftly responded by mass detentions. A total over 100,000 arrests were made nationwide, mass fines were levied, bombs were airdropped and demonstrators were subjected to public flogging. The movement soon became a leaderless act of defiance, with a number of acts that deviated from Gandhi's principle of non-violence. In large parts of the country, the local underground organisations took over the movement. However, by 1943, Quit India had petered out. The RIN Mutiny (also called the Bombay Mutiny) encompasses a total strike and subsequent mutiny by the Indian sailors of the Royal Indian Navy on board ship and shore establishments at Bombay (Mumbai) harbour on 18 February 1946. From the initial flashpoint in Bombay, the mutiny spread and found support through India, from Karachi to Calcutta and ultimately came to involve 78 ships, 20 shore establishments and 20,000 sailors. The RIN Mutiny started as a strike by ratings of the Royal Indian Navy on the 18th February in protest against general conditions. The immediate issues of the mutiny were conditions and food, but there were more fundamental matters such as racist behaviour by British officers of the Royal Navy personnel towards Indian sailors, and disciplinary measures being taken against anyone demonstrating pro-nationalist sympathies. The strike found immense support among the Indian population already in grips with the stories of the Indian National Army. The actions of the mutineers was supported by demonstrations which included a one-day general strike in Bombay. The strike spread to other cities, and was joined by the Air Force and local police forces. Naval officers and men began calling themselves the Indian National Navy and offered left handed salutes to British officers. At some places, NCOs in the British Indian Army ignored and defied orders from British superiors. In Madras and Pune, the British garrisons had to face revolts within the ranks of the British Indian Army. Widespread riotings took place from Karachi to Calcutta. Famously the ships hoisted three flags tied together — those of the Congress, Muslim League, and the Red Flag of the Communist Party of India (CPI), singnifying the unity and demarginalisation of communal issues among the mutineers. The true judgment of contributions of each of these individual events and revolts to India’s eventual independence, and the relative success or failure of each, remains open to historians. Some historians claim that the Quit India Movement was ultimately a failure and ascribe more ground to the destabillisation of the pillar of British power in India — the British Indian Armed forces. Certainly the British Prime Minister at the time of Indepence, Clement Atlee, deemed the contribution of Quit India as minimal, ascribing stupendous importance to the revolts and growing dissatisfaction among Royal Indian Armed Forces as the driving force behind the Raj’s the decision to leave India. Some Indian historians however argue that, in fact, it was Quit India that succeeded. In support of the latter view, without doubt, the War had sapped a lot of the economic, political and military life-blood of the Empire, and the powerful Indian resistance had shattered the spirit and will of the British government. However, such historians effectively ignore the contributions of the radical movements to transfer of power in 1947 Regardless of whether it was the powerful common call for resistance among Indians that shattered the spirit and will of the British Raj to continue ruling India, or whether it was the ferment of rebellion and resentment among the British Indian Armed Forces , what is beyond doubt, is that a population of millions had been motivated as it never had been before to say ultimately that independence was a non-negotiable goal, and every act of defiance and rebel only stoked this fire. In addition, the British people and the British Army seemed unwilling to back a policy of repression in India and other parts of the Empire even as their own country lay shattered by the war's ravages. The INA trials in 1945 ( The Red Fort Trial) and the Bombay mutiny had already shaken the pillars of the Raj in India. By early 1946, all political prisoners had been released. British openly adopted a political dialogue with the Indian National Congress for the eventual independence of India. On August 15, 1947, the transfer of power took place. A young, new generation responded to Gandhi's call. Indians who lived through Quit India came to form the first generation of independent Indians — whose trials and tribulations may be accepted to have sown the seeds of establishment of the strongest enduring tradition of democracy and freedom in post-colonial Africa and Asia — which, when seen in the light of the torrid times of Partition of India, can be termed one of the greatest examples of prudence of humankind. On 3 June 1947, Viscount Lord Louis Mountbatten, the last British Governor-General of India, announced the partitioning of the British Indian Empire into a secular India and a Muslim Pakistan. At midnight, on 15 August 1947, India became an independent nation. Violent clashes between Hindus, Muslims, and Sikhs followed. Prime Minister Nehru and Deputy Prime Minister Sardar Vallabhbhai Patel invited Lord Mountbatten to continue as Governor General of India. He was replaced in June 1948 by Chakravarti Rajagopalachari. Patel took on the responsibility of unifying 565 princely states, steering efforts by his “iron fist in a velvet glove” policies, exemplified by the use of military force to integrate Junagadh, Jammu and Kashmir, and Hyderabad state into India. The Constituent Assembly completed the work of drafting the constitution on 26 November 1949; on 26 January 1950 the Republic of India was officially proclaimed. The Constituent Assembly elected Dr. Rajendra Prasad as the first President of India, taking over from Governor General Rajgopalachari. Subsequently, a free and sovereign India absorbed two other territories: Goa (liberated from Portuguese control in 1961) and Pondicherry (which the French ceded in 1953–1954). In 1952, India held its first general elections, with a voter turnout exceeding 62%; this made it the world’s largest democracy.